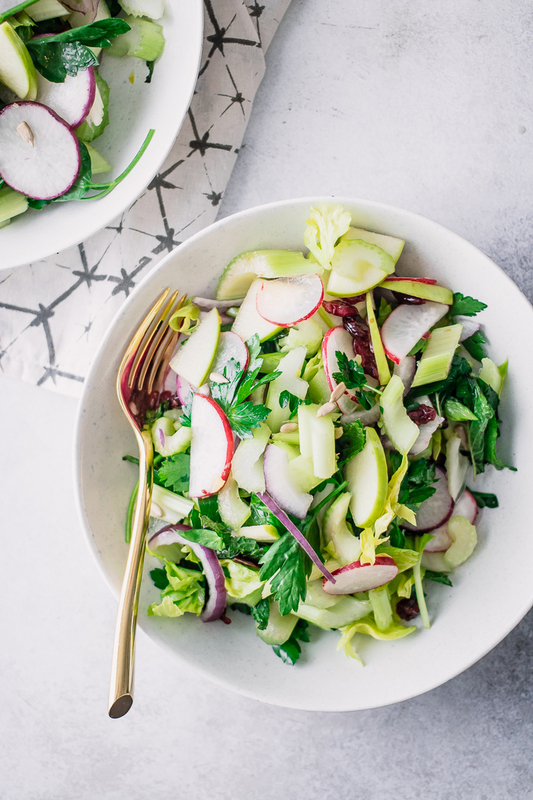 Crunchy Celery Apple Salad, a light and refreshing celery salad with crisp green apples, radishes, red onion, fresh parsley and mint, dried cranberries, and sunflower seeds. The perfect way to use up leftover celery! Have you ever noticed that when celery is used in a dish the recipe always calls for “1 stalk” of celery? And then you’re stuck with a huge bunch of celery and you have no idea what to make with it? Beyond the childhood favorite “bumps on a log,” celery isn’t the type of vegetable that is the main event of a dish and is usually relegated to be a complimentary ingredient. Well, this Crunchy Celery Apple Salad is here to change that. 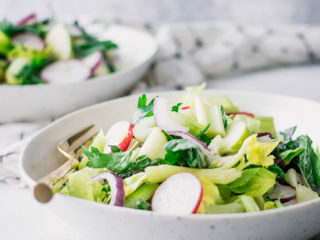 This fresh salad uses sliced celery stalks, crisp green apple slices, and crunchy radishes and is tossed with fresh parsley in a light olive oil and lemon dressing. Sweet and tangy dried cranberries and crunchy sunflower seeds top off the dish and take the crunch factor to the next level. This Crunchy Celery Apple Salad is a perfect option for outdoor cookouts and picnics, as the apples and celery hold up well for traveling and do not wilt when dressed like salads made from leafy greens. It’s also a simple recipe that comes together in less than ten minutes, so it’s a perfect side dish or quick lunch if you have extra celery lying around after making soups or stews. This light salad does not require special ingredients or tools, however there are a few pieces of kitchen equipment that will make preparing this Crunch Celery Apple Salad easier. A great set of mixing bowls: For years I avoided buying a good set of mixing bowls and tried to survive with just one large hand-me-down bowl from my mother. I’m a (wannabe) minimalist, I don’t need mixing bowls! Well, I finally broke down and bought a set of clear Pyrex glass bowls and I have to say my life is much easier for it. A great set of knives: A great set of kitchen knives are essential and come in handy when slicing and dicing crispy vegetables. This Crunchy Celery Apple Salad is a new favorite easy salad recipe in our house! If you’re looking for more simple and refreshing salads, try out our Za’atar Crispy Chickpea and Leek Salad and Summer Peach Panzanella Salad. They’re sure to hit the spot! Did you make this Crunchy Celery Apple Salad recipe? Don’t forget to leave a comment below and let us know how it turned out, and save it to your salads board on Pinterest and tag me on Instagram. I want to see your salad creations! 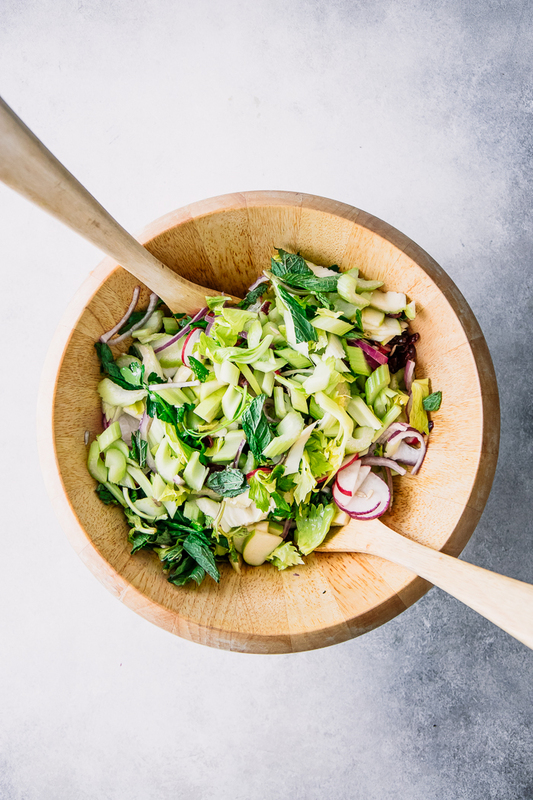 Crunchy Celery Apple Salad, a light celery salad with crisp green apples, radishes, red onion, fresh parsley and mint, dried cranberries, and sunflower seeds. 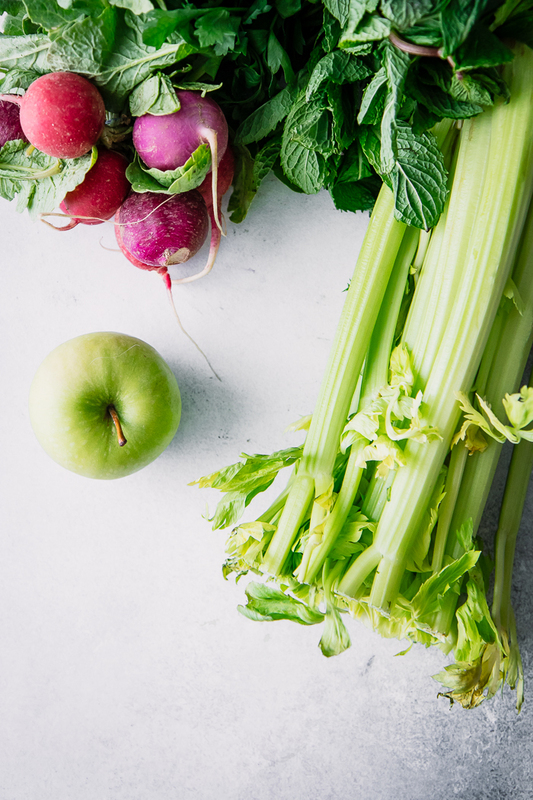 Toss chopped celery, apple, radishes, onion, parsley, and mint leaves in a large mixing bowl. Combine lemon juice, olive oil, salt, and pepper and drizzle on salad. Toss to coat and top with sunflower seeds. 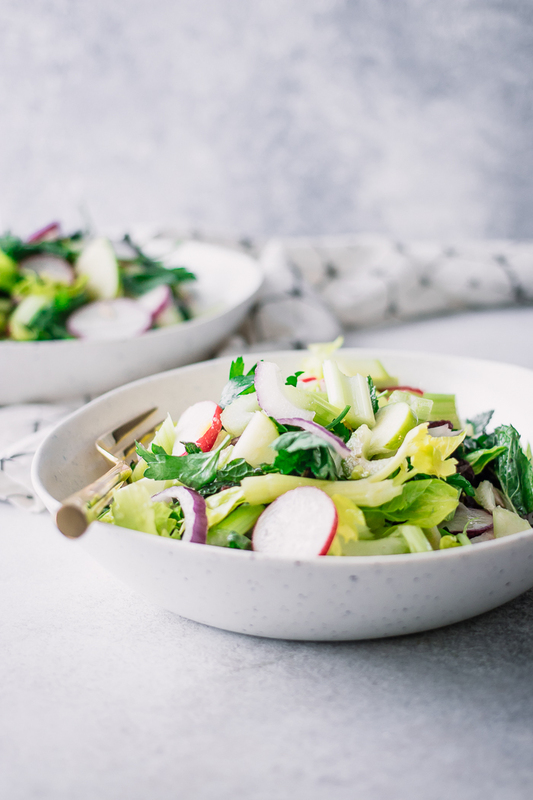 Leftovers & Storage: Because of the crunchy nature of celery, apples, and radishes, this salad is a great make-ahead option for outdoor parties and picnics. It will hold up well for about 2-3 days in the refrigerator if dressed, up to four days if dressing is added later. Nutrition: This salad is a a great side dish meant to be paired with your choice of protein and / or whole grains. It is low in saturated fat, high in fiber, and packs an antioxidant punch from the array of fresh vegetables, fruits, and healthy fats. *Recipe inspired by and adapted from Well + Good’s celery salad. Thank you! Yes, it was delicious. I am not a huge celery fan usually unless it’s smothered in nut butter, but this combination with apples and cranberries is really delicious. I made this tonight, with a few minor changes. Less onion, and added a little white balsamic and honey to the dressing. It was delicious! So fresh and perfect for a spring dinner. Served this salad with grilled Morocco salmon, lemon rice pilaf, and asparagus. Thank you!!!!! Oooh, white balsamic and a little honey would be delicious in this celery salad! I’m glad you liked it, I was inspired by a simple celery salad I had while out and it’s now become one of our warm weather favorites. Thanks for leaving a comment!